Review by AllTheBestFights.com: 2017-10-13, fight not particularly good between Fidel Maldonado Jr and Ismael Barroso: it gets two stars. Fidel Maldonado Jr entered this fight with a professional boxing record of 24-3-1 (19 KOs=79%) and he is ranked as the No.27 super lightweight in the world. He lost to Amir Imam in 2015 (=Maldonado vs Imam) but since then he has collected five victories and one draw beating Mohamed Rodriguez and Pablo Cesar Cano in 2017. His opponent, the former interim Wba Lw champion Ismael Barroso, has an official record of 19-1-2 (18 KOs=95%) but he is not ranked as he hasn’t fought since May 7, 2016 when he was defeated by Anthony Crolla (=Crolla vs Barroso). Before this bout he had won over Kevin Mitchell (=Mitchell vs Barroso). 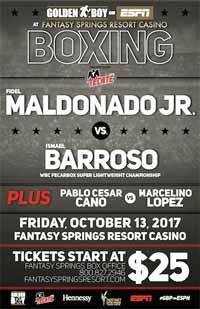 Barroso vs Maldonado is valid for the WBC FECARBOX super lightweight title. Watch the video and rate this fight!